It's Labor Day, time for some fun and action. It's time to reinvent your lazy side and start relaxing. Thus it is the time for some true action. Why not make this year labor day a special one? Plan out something unique. Arrange for some parties, go out small tours and many more. There's so many ways of celebrating this day.And if you are confused as how to plan out this year Labor Day, then make sure you download these screensavers and install them on your desktops and laptops, for they will surely guide you through your confusions and thus will render you with some perfect solutions as how to make use of this day, yet in a musical way. And if you want to refer this page to your near ones as a form of gift on the occasion, then click here. This screensavers will surely enchant your loved ones as well. Celebrate this year Labor Day with this musical Labor Day screensaver featuring the fun that a Labor Day is indeed worth of. Download them and celebrate this year Labor Day and derive the idea how to celebrate this year Labor Day! 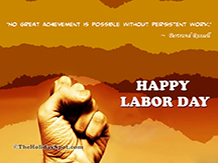 Learn the true essence and importance of Labor Day. Show the world how you indeed observe the day and how this particular day is worth of celebration. This quote incorporated screensaver will surely help you understand this day in a better way.